The above info came from Brandon Gordon, and was edited by yours truly (contact me). The image came from Consoles Fan. 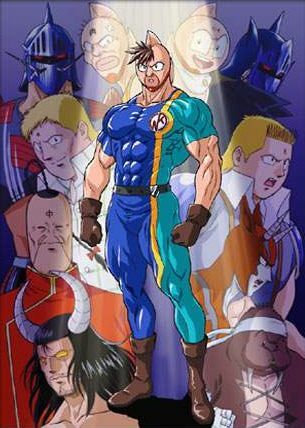 Kid Muscle Nisei Kinnikuman Terry Kenyon Jr. Terry "The Kid"
Taking place two decades after the exploits of the legendary wrestler Kentaro "King Muscle" Kinnakuman, the spotlight goes over to his greedy, cocky, and overall cowardly son, Mantaro "Kid Muscle" Kinnikuman. Despite his whining, the Kid is ripped from his life of being spoiled by his mom and is sent to Earth as a drafted member of a new generation of Muscle League to fight the newly rebuilt DMP. The above description came from Brandon Gordon and fractyl2, and was edited by yours truly (contact me).